In the later part of the 19th Century, a structure was built at a location along what is now called Drew Avenue in Buttermilk Falls, New York. Over the years and centuries, many family surnames such as Shelley, Boyan, Rafferty (also 23 Drew), Soronen, Childs, Ogden, Mooney, Barna, and Pecchiar have been associated with the address. This is a Shelley tale, and is one of the earliest to be recalled by the family. During the closing years of the 19th century, the "Family Homestead" served as a home, a boarding house and as a saloon or drinking establishment. To this day, residents are well aware of the notoriety of the Hudson Highlands as a location to quench ones thirst, to imbibe with friends, or to simply hoist a few when the occasion fit. The saloon at 22 Drew was one of many stops along the way that filled an established need. This is a very short story of the very short history of a very small tavern. The three story home (actually two stories with a living space also available in the expansive attic) was truly multipurpose, serving as a home, a boarding house, and a saloon. That was the way families survived in the day; maximizing the function while minimizing the expense. Neighborhood saloons served a single purpose, and that would be satisfying a thirst or a need, and very often the two purposes at the same time. As the family story has been told, the establishment had a short but colorful reign as a respite for a thirst. I'm sure the saloon had its regulars as well as the occasional drifter; but one day (or possibly one evening) a patron who had had a few, stood, turned and marched toward the exit to make use of the "facilities" located in a small house "out" at the rear of the building. 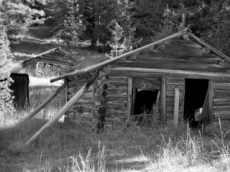 To reach the yard and the outhouse, one had to go through the saloon door, turn to the right and proceed down the stairs. Well, this is where the 22 Drew Avenue tale ends. When staggering to the facility, a left turn was taken instead of the proper right, launching the patron through the wrong door and head-first to the storage cellar which was many feet below. You, the reader, must write your own conclusion to the wayward walker's fate. Perhaps he rose, dusted himself off, and laughed at his own buffoonery. Perhaps not. To help you along a bit, let me tell you that a very short time later, the saloon owner decided to permanently close the establishment, making the entire homestead into an expanded residence and boarding house. The final pint had been lifted....or so goes another Irish tale.